White paper on crime 2004 Part4/Chapter2/Section4/3. Fig. 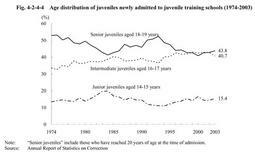 4-2-4-4 shows the age distribution of juveniles newly admitted to juvenile training schools during a30-year period from1974.Senior juveniles aged18-19accounted for more than50%of the total in1974but gradually declined thereafter,and intermediate juveniles aged16-17were slightly more than that of senior juveniles through1999and2001.Senior juveniles overtook intermediate juveniles again in2002and remained slightly more than intermediate juveniles in2003. Examining the age of newly admitted juveniles in training schools in2003by gender,18-year-olds had the largest share(25.1%)among males,followed by17-year-olds(23.2%),and19-year-olds(19.7%).Among females,16-year-olds(20.9%)had the largest share,followed by18-year-olds(18.9%),and17-year-olds(18.5%).It means that females are more likely to be admitted at a younger age than males(Source:Annual Report of Statistics on Correction). Fig. 4-2-4-5 shows the percent distribution of delinquency type committed by juveniles newly admitted to juvenile training schools in2003by gender and age group.For males,theft had the largest share in all age groups,followed by injury/assault,robbery,and extortion in junior juveniles,whereas it was followed by violations of the Road Traffic Law,robbery,and injury/assault in intermediate and senior juveniles.As for females,the percentage of status offenses fell as they got older,while that of violations of the Stimulant Drug Control Law rose.In female senior juveniles,such violations accounted for almost50%. Fig. 4-2-4-6 shows trend in the percent distribution of delinquency type of juveniles newly admitted in training schools for10-year period from1994.The percentage of theft had been gradually declining until2001,when it started to rise.Violations of the Stimulant Drug Control Law,in a declining trend in recent years,decreased both in number and percentage in2003from the previous year.Those juveniles admitted for robbery were on the rise since1996and increased by65from the previous year in2003. Fig. 4-2-4-7 shows the percent distribution of protective measures history of juveniles newly admitted to training schools in2003by gender.Those juveniles admitted to training schools for the first time accounted for83.0%of males and91.3%of females.While about50%of male were admitted for the first time but had histories of other protective measures,almost60%of females were admitted for the first time without any history of other protective measures. Fig. 4-2-4-8 shows the length of period between the previous disposition(including dispositions other than protective measure such as dismissal without hearing and dismissal after hearing)and delinquent act that juveniles committed and were thus admitted to training schools,during a10-year period since1994.The percentage of those with previous disposition ranged from70%to80%of the total.About70%of those with previous dispositions committed delinquent acts again within one year after their previous dispositions. Fig. 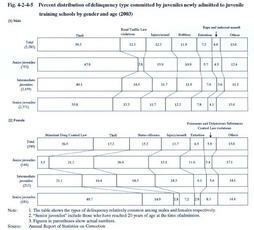 4-2-4-9 shows the percent distribution of juveniles newly admitted to juvenile training schools in2003by type of delinquent groups they had related with and by gender.Slightly less than60%of males had some relationship with delinquent groups,while less than50%of females did.By type of delinquent group,motorcycle gangs,known as bosozoku,had a same share as local delinquent groups in males,while in females,bosozoku had a smaller share and organized crime groups had a larger share than males did. In the long term,the proportion of juveniles who had relationships with delinquent groups when they were admitted to juvenile training schools had accounted for about50%of the total until1988,but has been about60%since1989(Source:Annual Report of Statistics on Correction). Fig. 4-2-4-10 shows the percent distribution of juveniles newly admitted to juvenile training schools in2003by number of accomplices they committed offenses with and by gender.Females are more likely to commit offenses alone or by a group of two accomplices than males,while males are more likely to commit offenses by a group of three or more than females. According to a breakdown by the relationship with accomplices,both males and females were most likely to commit an offense with their friends(40.8%males and33.7%females),followed by members of delinquent groups(22.1%males and7.2%females)(Source:Annual Report of Statistics on Correction). Fig. 4-2-4-11 shows the percent distribution of juveniles newly admitted to juvenile training schools in2003by education level and by gender.Junior high school graduates had the largest share,followed by senior high school dropouts. Fig. 4-2-4-12 shows the percent distribution of juveniles newly admitted to training schools in2003by status of employment or education and by gender.Those unemployed accounted for46.0%of the total,while those employed accounted for31.9%.In females,those unemployed or pupils/students had a larger share and those employed had a smaller share than males. Among the juveniles newly admitted to juvenile training schools in2003,46.7%(47.8%for males and36.3%for females)had their biological parents as guardians.Their percentage declined by2.0points from the previous year(Source:Annual Report of Statistics on Correction). Fig. 4-2-4-13 shows the percentage of those juveniles admitted to the training schools who lived with their families when they committed offenses during the20-year period from1984.The percentage has been on a rising trend in both males and females. Regarding drug offenses committed by the juveniles newly admitted to training schools in2003,as far as males are concerned,Stimulant Drug Control Law violations accounted for1.3%,while Poisonous and Deleterious Substances Control Law violations accounted for2.0%.As for females,Stimulant Drug Control Law violations accounted for26.5%,while Poisonous and Deleterious Substances Control Law violations accounted for5.9%.The percentage of drug offenses is higher among females than among males(see Appendix4-12). An examination on drug abuse of the juveniles newly admitted to juvenile training schools in2003,when they committed offenses including non-drug offenses,revealed that the percentage of drug abuse declined by2.1points from the previous year to17.1%.By gender,the percentage for males was14.3%while that for females was44.8%.By type of drug abused,organic solvents had the largest share(72.2%)for males,followed by stimulant drugs(16.3%).As for females,stimulant drugs were most frequently abused(65.3%),followed by organic solvents(33.5%)(Source:Annual Report of Statistics on Correction). A total of43foreign juveniles(40males and3females),who need treatment programs different from Japanese,were newly admitted to juvenile training schools in2003,an increase by one from the previous year.They were placed in the living guidance course(G2).By nationality,Brazilians(36juveniles)had the largest share.By type of delinquency,robbery was the most frequently committed(14juveniles,increased from seven in2002),followed by theft(13juveniles,decreased from26in2002).Of the total of43,19juveniles had been placed on probation,and three had been committed to juvenile training schools before(Source:Annual Report of Statistics on Correction).